Vibrio bacteria are common and occur naturally in many marine environments. They are not related to pollution! 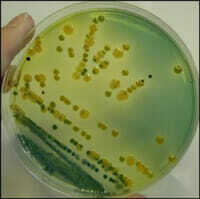 Most Vibrio bacteria are benign, but two species, Vibrio parahaemolyticus (V.p.) and Vibrio vulnificus (V.v.) have been associated with human illness. According to the latest statistics, less than one percent of food-borne illness is related to Vibrio, while the vast majority are associated with vegetable, chicken and meat products. Shellfish, which are filter feeders, can accumulate Vibrio bacteria. If enough of the bacteria are consumed by humans, illness can result. The most common symptoms are mild flu-like gastroenteritis that typically passes in two to three days. V.p. outbreaks are typically associated with shellfish harvested in warmer waters and are common in Japan. They are also occasionally found on the Pacific and Gulf Coasts, and one outbreak has been reported on the East Coast. V.v. infections have also come from swimming in Gulf Coast waters by those with cuts, abrasions or open wounds. Individuals who are immune-compromised (from liver disease, immuno-suppressant drugs, etc.) can have more severe reactions to V.v, including blood disorders, and in rare cases, death. These high-risk individuals should be wary of eating raw shellfish or any raw proteins, but can safely enjoy thoroughly cooked seafoods. To ensure the safety of shellfish, the U.S. Food and Drug Administration (FDA), in cooperation with state health departments, carefully regulates shellfish-growing areas and the care and handling of shellfish. The National Shellfish Sanitation Program (NSSP) requires harvesters and dealers to be licensed, inspected and certified. Our nation's shellfish suppliers are heavily regulated. Seafood is an essential part of a healthy lifestyle. In fact, in its 2005 Dietary Guidelines, the U.S. government prominently featured recommendations for Americans to maintain a healthy weekly serving of seafood in their diets. Proteins, vitamins and fatty acids found in seafood contribute to improved cardiovascular and neurological health, as well as to healthy physical development in children.